This MaxTow Custom Gauge Package allows you to select 3 truck gauges from MaxTow’s Blue Double Vision™ Gauge Series to install with the included truck specific triple pillar pod. The MaxTow Double Vision Gauge Series offers users with a dual readout display that includes a “quick glance” blue LED digital display as well as the classic look of an analog gauge through use of the illuminated red needle. Each gauge features a diameter of 2 1/16" (52mm) and out performs the competition by utilizing the combination of electronic sensors and stepper motor technology that allows for extremely smooth needle movement and precise gauge readings. MaxTow Gauges also feature daytime (d1, d2, d3) and nighttime (n1, n2, n3) dimming modes where you can set your preferred brightness level whether you’re driving during the day or the late hours of the night! The included brightness recall function remembers the previous brightness setting you had selected before powering your truck down so you won’t have to worry about resetting it every time you power your truck on! MaxTow includes extended wire harnesses for both power (3') and sending unit (9') connections to ensure you’ll have more than enough for a complete installation! Don’t forget to take a moment and check out the available gauges below to see which are recommended for your truck and engine! Get ready to hit the road and Tow to the Max™! For Ford Diesel Power Stroke applications MaxTow recommends our 60 PSI Boost Gauge, 1500 Degree Exhaust Gas Temperature Gauge, Transmission Temperature Gauge or 100 PSI Fuel Pressure Gauge. For gasoline truck applications, MaxTow recommends our 2200 Degree Exhaust Gas Temperature Gauge, 100 PSI Fuel Pressure Gauge, Transmission Temperature Gauge or Water Temperature Gauge. 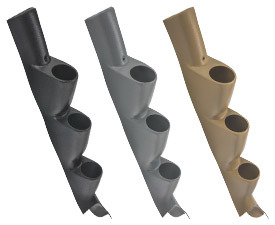 The included triple pillar pod is specifically designed for the 2011-2016 Ford Super Duty and is available in black or factory match gray and tan. This pillar pod replaces the existing A-pillar trim giving your Super Duty a custom fit and finish without any obstructions. This pod holds (3) 2 1/16" (52mm) gauges and is crafted from the highest quality ABS plastic allowing it to withstand cracking, fading, and warping over longtime use.